Let the experienced professionals at Heritage House Dental, a Heartland dentist, help you put your best smile forward. Using up-to-date research along with state-of-the-art equipment, our team of dentists, hygienists, and dental assistants provides a complete range of dental services in Heartland – from basic care to a total cosmetic makeover. So you can convey your very best, each time you smile. What are your best options for replacing missing teeth? Is Dental Implant therapy for everyone? What does it really entail? 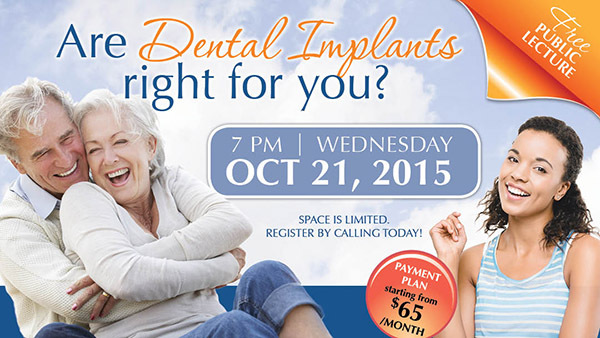 Please join us on Wednesday, October 21st, 2015 at 7 p.m. for a free public lecture about Dental Implants. Dr. Kate Bazydlo and her staff will be there to provide you with information on the value of Dental Implants and to answer any questions that you have. Light refreshments will be served. We look forward to seeing you.